Can a ski boot with a novel new design influence other ski boot manufacturers even if that novel boot never made it to market? Daniel Post was a mechanical engineer and a skier. In the late 1960s while he was teaching at RPI in Troy, New York, he’d take his entire family skiing at Jiminy Peak. All of the Post kids became accomplished skiers. In fact his twin daughters, Ellen and Marion, will be inducted into the United States Ski and Snowboard Hall of Fame this Saturday right here in Stowe! In those late 1960s, plastic boots were taking over the market. But Daniel Post still wasn’t that happy with his ski boots, particularly the beating his shins took from the stiffer plastic boots. Being a mechanical engineer he believed extending the front of the boot higher could provide better leverage and spread the pressure over a greater area. He experimented with his own boots by extending a cuff almost up to the knee. Post was very pleased with the results on his skiing. Post patented his idea for a “lever-type ski boot” in 1973 and started marketing the idea to ski boot companies. Lange took a one year option on the patent, but never came up with a viable design. Daniel Post further refined his idea and this time drew the interest of Herman Kastinger, head of Kastinger ski boots. Kastinger enlisted Ferry Porsche’s design group to design the boot. Yes, that’s the same Porsche as the car! They came up with a rear entry boot that had a separate cuff which wrapped around the calf. Forward flex was controlled by a hydraulic cylinder – that’s what you get when you let a car company design a ski boot! 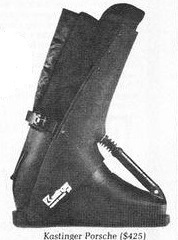 Financial problems at Kastinger slowed the production of the Kastinger Porsche ski boots. During that time several competing boot companies started developing their own “knee-high” boots. The build-up for the 1980-81 ski season saw four entries in the “knee-high” category: the Kastinger Porsche, the Nordica Polaris, the Tecnica Squadra, and the Dolomite Secret Weapon. The Nordica, Tecnica, and Dolomite were really just traditional front buckling boots with an extended high cuff. 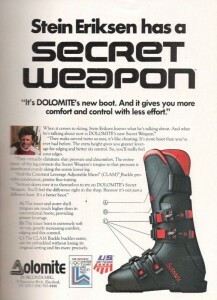 The ski magazines hyped the new boot designs and even Sports Illustrated featured an article on Daniel Post and the knee-high boot revolution he inspired. The only problem was the Kastinger Porsche never made it to the ski shops! The Kastinger financial problems were too large, the factory closed, and the Porsches never shipped. The Dolomites and Nordicas sold very well that season and inspired other brands to produce models with higher cuffs in 1981 and 1982. So the Kastinger Porsche boot based on Daniel Post’s concept inspired a trend toward knee-high ski boots in the early 1980s. No one had the correct answer to last week’s trivia question. It was kind of an unfair question since the Kastinger Porsche never made it onto the slopes, but I know there are many RetroSkiers who remember the knee-high boots that resulted from the Porsche’s design. The knee-high trend was short-lived. They disappeared by the 1983-84 season although all ski boots incorporated a higher profile than they had previously. There were still skiers including Daniel Post who swore by the comfort and control offered by the knee-highs. So why did ski boot manufacturers abandon knee-highs? There are a lot of theories. One contributing factor definitely was that in 1980, the same year the knee-highs were introduced, Salomon introduced the rear entry SX90. Its popularity meant that other boot makers would have to consider rear entry models. 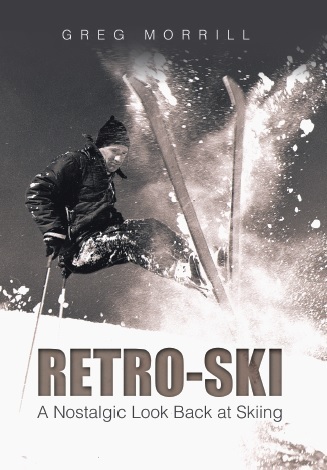 Both the knee-highs and the rear entry boots targeted the same market – skiers who put a priority on comfort. Rear entry or knee-highs never caught on with racers or would-be racers. So rear entry boots won that battle. innovated for years . Maybe Elon could give it a go and shake the industry up a bit !!! Dan Post was my biomechanics teacher at VPI in the early 80s and we heard about these boots. I later skied with my husband and ruptured my ACL. I always wondered why Professor Post’s boots were not available and if they would have protected my ACL. Thanks for the info. Maybe Elon could contact the professor? 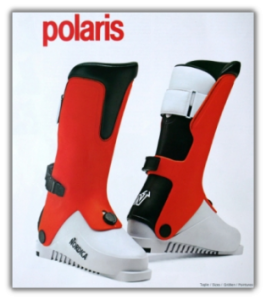 I bought my pair of Nordica Polaris 1981 – it was the last pair in my size in the most well known store in Munich, Germany. For many years I enjoyed having these “perfect controllers” for my skies! As I remember 1984, some freaks opened a shop at Paris (France) for used Polaris, because all the cool guyes at Chamonix knew: There’s only one choice out there if you’r out to race bumpy slopes or jump tricks (a rotor or a back scratcher was most fashionable those days). With Polaris between your feet and your skies, you learned a new style to race: Left/right movements of your knees directly and most precisely led to a reaction of the ski. Previously I always tried to press the outer or the inner edge of the sole down to the slope – with polaris at your feet it became just a question of the movement of your knees. Unfortunately my pair of boots broke – but funny thing: In 2009 I skied at Hintertux (Austria). After a long day of hard work for my boots, the both broke in the same second at a more of less unspectacular jump. As if an atomic clock would have defined “end of season” 😉 ! After 28 and a half years both boots broke in the same second. After that I bought the best otehr I could find, but skiing was no more what it used to be. In 2016 I stopped skiing – I don’t like that sh.. no more. I had a pair of Polaris as well. I threw them in the dump in 2010, when cleaning out the house after my parents, something i deeply regret. Aswome boots.